eStore is a clean, beautiful and fully customizable responsive WooCommerce WordPress theme. This theme packs many premium features and several custom widgets which helps making your online store professional and well organized. Theme is fully compatible with WooCommerce and YITH WooCommerce Wishlist plugins. 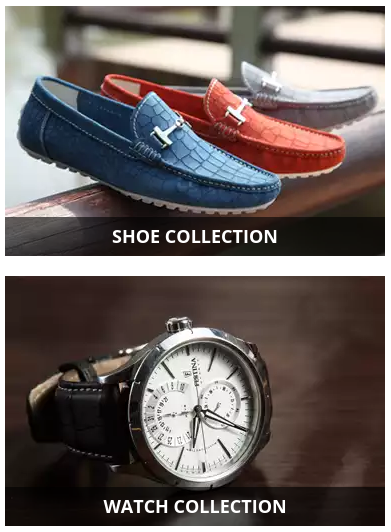 As an online store owner, attracting customers and selling products will be lot easier with this theme. Installing your theme is pretty easy! After downloading you should have a estore-pro.zip file. This is a compressed file containing all of the required templates and images required for the theme to function properly. Primary MenuDisplay the menu on the Left side on the Header. Category MenuDisplay the menu on the left side of primary menu. Suitable for showing categories if you are using theme with WooCommerce. Header Top Bar MenuDisplays the menu on top right header bar. You need to activate Header Top bar to show this menu. After uploading logo from Site Identity Section, there are options to display Header Text only (Site Title and Tagline ), Logo only, display both Logo and Header Text or display none of them. Note:If you choose this layout option, then, you might look for adding the widget TG: product Slider available within this widget, which is made suitable for this style of the Header. You can also add links there. If you are using WooCommerce in your site, click on checkboxes to Enable My Account Button and Currency Symbol. If you are using WPML, click on checkbox to Enable Language Selection from WPML. These buttons will be visible on Header Right section beside Menu. Note: You must enable Header Top Bar to display them. Front Page Template is design to display the widgets used in the Front Page Template Sidebar( Appearance-> widgets). You can use a page (which is assigned to Home Template) to display widgets on the Font Page. Create 2 pages ie, Home and Blog Page. Assign “Home” page to Home Template. Go to Appearance-> widgets and drag/select the widgets to the Front Page Template Sidebar. Now Home Page will display all the widgets used in Front Page Template Sidebar. eStore provide 12 awesome widgets that you can use in Front Page Template Sidebar to make your site look amazingly Beautiful. Go to Appearance-> widgets, drag/select the widgets in the Front Page Template Sidebar to display it on the Front Page Template Page. Enter your Advertisement Title or leave it blank. Upload your image or choose from Media Library. Drag the TG: About Widget to the Front Page Sidebar and enter the Title and select the page you created. Add your own button text according to the requirement of your site. You can link the button of this widget to any link as required for your site, which can be controlled by using this feature. Create a page, with the page template of Icon Text Template being selected for that page. In this widget, there is also the option of choosing the layout as per your site need, which is Two, Three and Four Column. Create a page, with the page template of Testimonial Template being selected for that page. If you like to have the background image for this widget, then, you can add it through the Background Image section and also same for the color, which is available through the Background Color option through this widget. Show your posts from certain category in Carousel. In this widget, enter Title, Description, Choose Category and number of posts you want to display. Info: The Recommended size for featured image is 444 by 444. Drag the TG: Category Carousel to the Front Page Sidebar. Enter the Title, Description, choose the category and enter the number of posts to display. The pro version of this theme has the option of two layout to be choosed from making it more versatile to display that widget in different way in your site. Info: The latest post will be displayed with large thumbnail and post excerpt. Info: The posts will be skipped if it doesn’t have featured image. Select source for your posts. Either Latest post or Specific Category’s Posts. Check to make the slider fullscreen. This option will enable the option of having the full screen slider for the home page. The recommended image size for this widget is 1900 x 1000 pixels. Check to enable Thumbnail pager. This option will create the pager option for this widget making the small images to be scrolled through the arrow keys in this widget, which makes the slider thumbnail images to be stacked in the same row.. This widget display your latest/featured posts. Select the number of posts to display from either the Latest Posts or Posts from the certain Category. If you choose to Show posts from a category than select the Category from the Drop-down option. This widget displays the image and the title of the selected pages. Drag the TG: Vertical Promo Widget to Front Page: Beside Slider Area. The pro version of this theme has the option of selecting the different layout, ie, it has two layout option and also one extra page can be selected in this widget. This widget displays the WooCommerce Category’s image with the title. Drag the TG: Vertical Promo WC Category to Front Page Sidebar. In the pro version of this theme, you have the option of choosing upto there category as per your requirement of the site. You also have the option of choosing the layout option as one or two, ie, you have two layout option for this widget to be choosed for. This widget displays the your sponsors/brand logos with optional link to them. Drag TG: Logo to Front Page Sidebar. Enter link where the logo should link to. Optionally, you can enter ‘#’ if you don’t want to link anywhere. The pro version of this theme for this widget has the option of making the logo to be slided. For this feature to be enabled in your site, you need to check on the checkbox having the option of Check to make the logo slider. Show your posts from certain WooCommerce category in Carousel. In this widget, enter Title, Description, Choose WooCommerce Category and number of products you want to display. Drag the TG: Product Carousel in the Front Page Sidebar. Enter the number of products to display. Select source for your posts. Either Latest post or Specific WooCommerce Category’s Posts. This option will enable the option of having the full screen slider for the home page. The recommended image size for this widget is 1900 x 1000 pixels. Use it to show your best product. This option will create the pager option for this widget making the small images to be scrolled through the arrow keys in this widget, which makes the slider thumbnail images to be stacked in the same row. Select source for your posts, ie, choose the required WooCommerce category for the tabs as needed. You can select upto four category for this widget to choose from. Choose the number of post to display in this widget in the Number of Products section. This widget displays featured image of the selected page with its title. Drag the TG: Horizontal Promo Widget to Front Page Sidebar area. The pro version of this theme has the option of selecting the different layout, ie, it has two layout option to be choosed from to display them uniquely in your site. This widget displays the WooCommerce Category’s image with title. Drag the TG: Horizontal Promo WC Widget to Front Page Sidebar area. In the pro version of this theme, you have the option of choosing upto there category as required for your site. We have added different layout option in this widget as to make your site look different as you need. It covers two layout option for this widget. eStore have Custom CSS Box which will ease your work if you need to add CSS in your site. Note: It will strip all the tags. Also, we strongly recommend not to edit the code in the theme’s file. All you changes will be lost if you update the theme. Use child theme instead. This theme has the feature of changing the Footer Copyright information as per your site need. You can change the Footer Copyright information of your site through Appearance->Customize->Additional Options->Footer Copyright Editor section. From this section, you can apply any of the Google font available within this theme to make your fonts look different throughout the site. It covers the changing of the font size of the Header Options such as Site title, Site Tagline and otheres. It covers almost all of the titles which has been used in the theme and can be used in the post such as all of the Headings tag. It covers the font sizes to be changed for the contents, ie, such as the paragraphs, buttons, etc. It covers the option of changing the font size used in this theme such as the footer copyright text and widgets. It covers almost all of the color options for the Header Sections such as site title and tagline and the primary menus. It covers the colors to be changed of different content parts such as Post title, Page title and much more. It covers the colors to be changed for the footer areas of this theme such as footer copyright color and widgets colors. 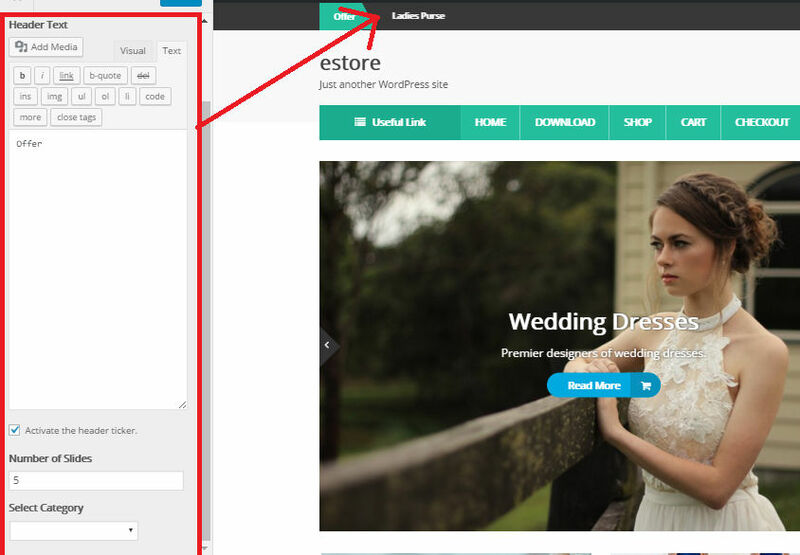 eStore theme is tested with several plugin and should work with most of them. We don’t provide plugin specific support unless it is trivial. 800px x 521px for the TG: Product Slider widget. 380px x 250px for the TG: Virtical Promo WC Category widget as well as TG: Horizontal Promo & TG: Vertical Promo widget too for first image. 1600px x 300px. for the TG: About Widget(Layout 1).Any image size for layout 2. 444px x 444px for the TG: Product Carousel widget as well as TG: Category Carousel & TG: Products Tabs. 75px x 75px for the small images in TG: Product Gride widget as well as for the TG: Category Grid) widget too bundled within this theme. 250px x 180px for the Hot product image inTG: Product Gridewidget as well as for the TG: Category Slider)widget as an option to make it use as the full width slider. 120px x 120px for the TG:Testimonial widget.